This week, which is also Social Media Week (SMW) in London, I have been learning a lot about Web 2.0 and how it crosses over into business networking. On Monday, for example, I attended SMW Be2camp, a workshop and networking event in London’s Euston area that was largely promoted using social media. The main presentations were also focused on how property/real estate professionals could make better use of Web 2.0 tools and techniques – and there were lots of lessons I could take away and apply to the construction sector. Most striking, though, was how the provision of a set of talks about social networking also provided a convenient excuse for a lot of business networking. Clearly, online networks can be a powerful way to boost your face-to-face contacts too. 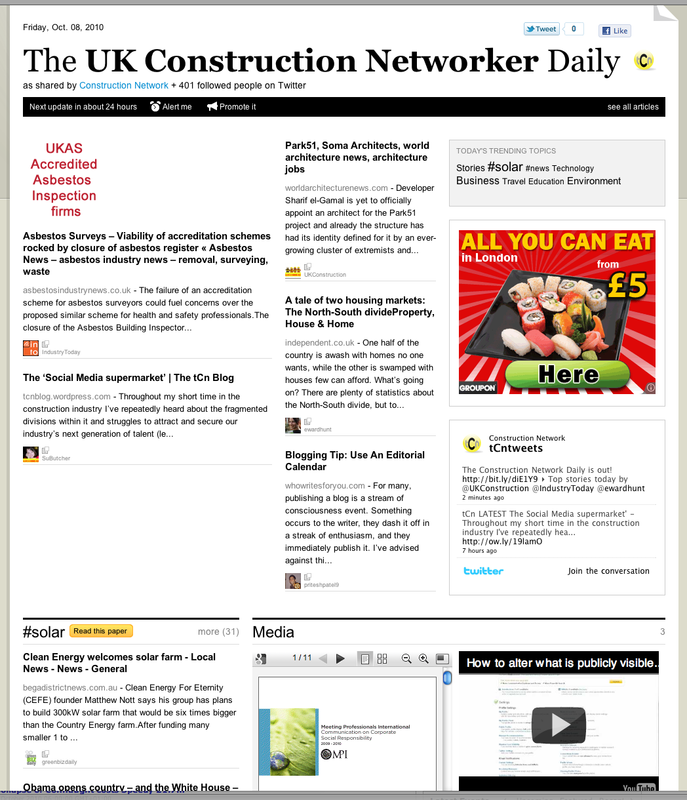 Two days later, I was back up in London for a two-day Construction Marketing conference organised by Emap. The first day was a training event which gave us delegates a grounding in the main social media tools – Twitter, blogs, LinkedIn and Facebook – and how to use them as part of the marketing process (something we’ve already started to do at tCn); I also learned about Twitter hashtags, used to identify tweets on a shared topic – the conference’s hashtag was #smaec, for example. The training day ended with a ‘tweet-up‘ – a social gathering organised via Twitter – in a nearby pub. As well as event delegates, other people invited some of their contacts and the result was a varied group of construction-oriented people meeting up for a beer or two near Tower Hill tube station. Good way to unwind and meet some new people. Ryan Briggs is the Founder of tCn and has spent over 10 years in the construction industry working with various local, regional and national organisations. Now working with construction training provider, Built for Training, he is keen to use the tCn platform to help bring our industry together utilising social media technology while encouraging the next generation of talent into careers within the built environment. This entry was posted in construction, marketing, Web 2.0 and tagged #smaec, Be2camp, blog, construction, Emap, Facebook, Latham, LinkedIn, marketing, property, real estate, social media, tCn, tweet-up, Twitter, Web 2.0. Bookmark the permalink.